It was a quieter, spiritually focused General Conference over the weekend for The Church of Jesus Christ of Latter-day Saints, in which leaders focused their remarks on classic topics such as faith, repentance and families. This was surprising to many, given that the past two General Conferences have featured major announcements (see here and here) about changes to church policies, such as last year’s decision to shorten the three-hour “block” of Sunday meetings to two. It was also surprising given how many rumors had been swirling around possible reforms, with some church members speculating that the faith’s dietary code would be relaxed around coffee and tea (dream on, Starbucks aficionados), or that missionary service would be shortened to 18 months for all missionaries. Neither of those came to pass. That’s not to say that the last week hasn’t been filled with surprising news. Just before General Conference, the church announced the reversal of a controversial policy regarding LGBT members and their families. At the conference itself, however, hard news was thin on the ground. Here are seven main takeaways from the weekend. Church leaders urged members to focus on developing spirituality at home. The phrase “home-centered and church-supported” appears to be the new buzzword in describing the institution’s approach to instruction at all levels. The new “Come, Follow Me” curriculum is designed for home use as well as discussion in church meetings, so some of the talks discussed ways for members to implement this approach in their lives. Apostle David Bednar may have cleared the way for greater transparency about the temple. For me, one surprise of the weekend was how specifically Bednar’s talk dealt with what church members can and cannot disclose in regard to the temple, the holiest site for Latter-day Saint ritual life. He quoted former prophet Ezra Taft Benson in saying that some members have erred on the side of caution in discussing the temple with their children and grandchildren, saying too little for fear they might reveal too much. In essence, Bednar clarified that young people will be better prepared for the temple if parents discuss with them everything except “the special symbols associated with sacred covenants” and “the holy information that we specifically promise in the temple not to reveal.” Using screenshots of the church’s website, he showed some of the resources now available online to help members begin these conversations. I was glad to see this. One takeaway about the temple findings from the Next Mormons Survey is that there was a correlation between feeling prepared for the temple and having a positive first experience in the initiatory and endowment. The church called its first African American general authority. Peter M. Johnson, an accounting professor who has taught at church-owned Brigham Young University and the University of Alabama, was called to be a Seventy. While the church has previously called men of African descent to positions of worldwide authority, Johnson is the first from the United States. There was, um, a 100% increase in women speakers! That’s my glass-half-full take on a perpetually dismal situation. In the October 2018 General Conference, there was only one female speaker — outside of the women’s session. This time around, there were two women — but no women’s session. (I think we are supposed to view that as an improvement . . . ?) As one friend on Facebook pointed out, it’s ironic that the church keeps urging men to listen to their wives when the model it provides about the actual importance of women’s voices is for women to occupy 5% of pulpit time in conference. On the plus side, Sharon Eubank’s talk. The first counselor in the women’s Relief Society general presidency and head of LDS Charities gave one of the best I’ve ever heard in any General Conference, managing to be both pastoral and theologically deep. Several historic “pioneer temples” will be renovated. Four 19th-century Utah temples will undergo extensive restoration to preserve their historic character. Temples in St. George, Salt Lake City, Manti, and Logan are all scheduled to be renovated, then rededicated when the projects are complete. Presumably this means that each temple will be open to the public for a brief time between its renovation and rededication. Eight new temples will be built around the globe. In the last few moments of the conference, church President Russell M. Nelson asked members to remain quiet, with no “verbal outbursts” of delight or surprise, as he announced the locations for eight new temples. Six are outside the United States (Pago Pago, American Samoa; Okinawa City, Japan; Neifu, Tonga; San Pedro Sula, Honduras; Antofagasta, Chile; and Budapest, Hungary) while two will be built in the western U.S. (Tooele, Utah. and Moses Lake, Wash). There are now 162 operating LDS temples around the world, with another 47 in some stage of development. 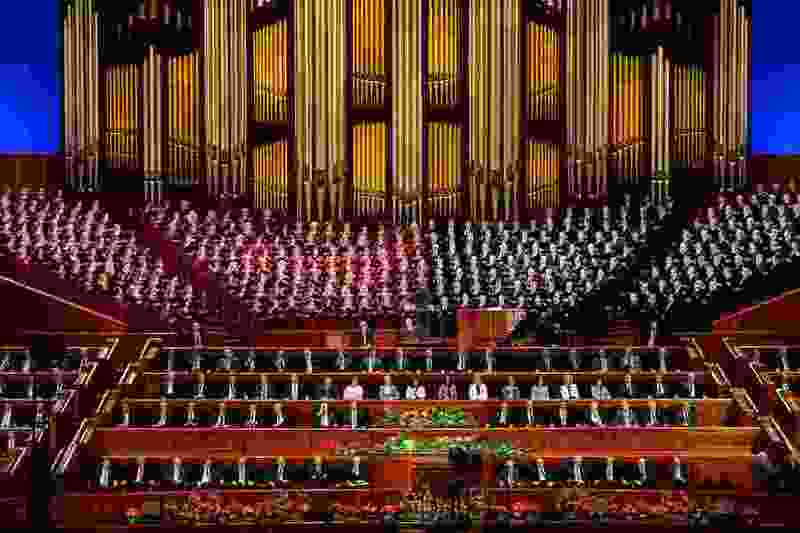 It didn’t take long for Brandt Malone of the Mormon News Report to provide me with an answer: according to the LDS Conference index, that phrase has only been uttered in conference 61 times . . . and 58 of them have been in this decade. And that was before this weekend.